General Motors began showing off the 2015 Cadillac Escalade earlier this week with a pair of tightly cropped images – one of the headlight and one of the new model emblem. There was also an accompanying video that featured an artist named Autumn de Wilde talking about capturing her passion for whatever she is shooting but that video didn’t include anything about the new Escalade. This time, GM hasn’t offered up any teaser images but we do get to check out five new videos focusing on the craftsmanship that are shot in an artful enough manner that I would believe that Autumn de Wilde may have been responsible for these short clips. Each of the five new 2015 Cadillac Escalade have titles that begin with “Escalade Reveal” and end with more specific titles including Brighten the Lights, Hand Sculpted, Hand Stitched, Hand Carved and Hand Cut Interior. Brighten the Lights offers another close up look at the high tech headlights while Hand Stitched shows someone hand stitching what appears to be the leather wrapped steering wheel of the new Escalade. Hand Sculpted shows someone working on a clay model that is likely a portion of the Escalade’s outer skin. Hand Carved and Hand Cut Interior both show someone working with wood but I cannot tell what the components are that are being produced. If you think that you know what those two videos are, feel free to offer up your insight in the comment section below. These videos really don’t do much more than tease the appetite of those who are hoping to put a 2015 Cadillac Escalade in their driveway (or garage if it will fit) but with Cadillac’s increasing focus on quality that rivals the biggest names in global luxury – these artsy videos showing the handcrafted workmanship that goes into each vehicle could help draw in new buyers. In the long run, videos like the ones above give us all a reason to talk about the new Escalade without General Motors actually showing it off ahead of the debut next month. The one video that does actually show a part of the 2015 Cadillac Escalade – Brighten the Lights – does offer a new angle at the sharp looking headlights that were revealed in the earlier teaser images. 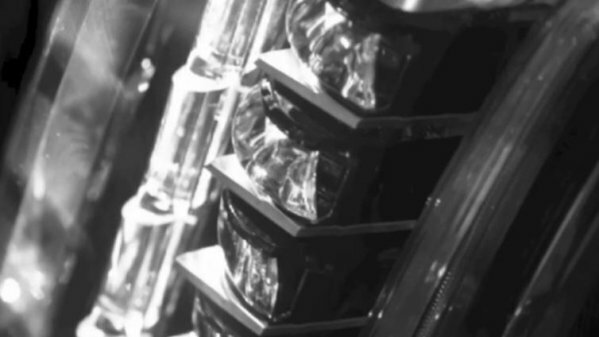 From the look of things in that short video clip (as shown above in the still image from the video), the row of HID projection units towards the outer edge of the assembly will be flanked by a row of what looks to be thin LEDs that I suspect will serve as the new Escalade’s Daytime Running Lights (DRLs). Just a reminder (one that you will get at the end of each video), the 2015 Cadillac Escalade will debut on October 7th at 7:30pm EST. however, with that being almost two weeks away, I would expect to see more teaser images and videos before the new high end luxury SUV is introduced in the flesh. Click here for a closer look at the two teaser images and the first video that debuted earlier this week!